This is a brand new release from Sinn, first shown at the MunichTime Watch Fair in October, 2018. 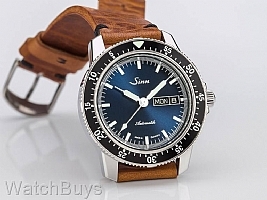 We have received requests for this new Sinn watch for a long time. In fact, it seems at every Road Show event one of the first questions we are asked is "When will Sinn make a version of the Sinn 104 with a blue dial?" We now have the answer to that question and the good news is now. Sinn has created an all new deep blue dial using traditional ornamental grinding techniques to produce a sunburst pattern. The color of this dial will change depending upon the light and angle producing deep, rich colors of blue in various shades. The result is a striking new Sinn 104 I that rounds out the collection. Although the Sinn 104 I St Sa B takes design cues from chronograph watches, it is not a chronograph but rather a time, day, date and rotating bezel watch. And to make things even more interesting the date display alternates between German and English if you are trying to brush up on your German language skills. 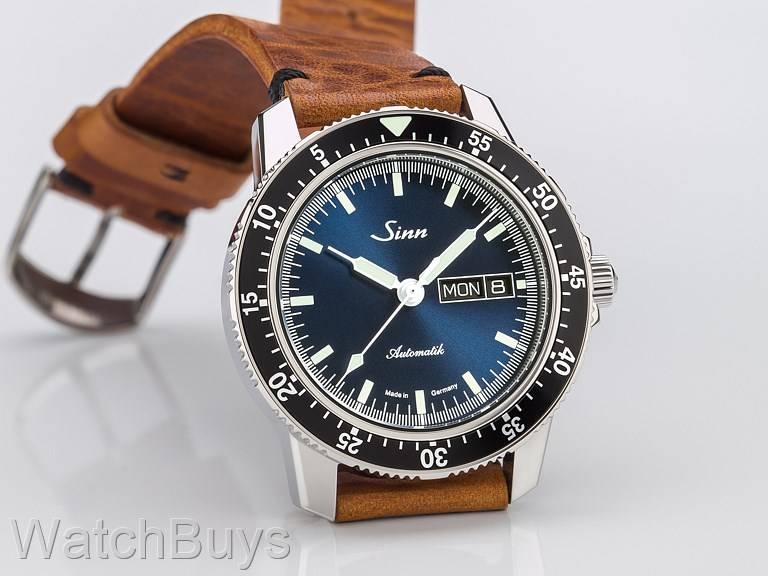 Everything about this watch is top notch, from the chronometer grade movement to the sapphire crystals used on both front and back, and the design and finish of the case leave no doubt that it's a Sinn. This pilot's watch is water resistant to 200 meters. The ratcheting bezel is of Sinn's design and will not snap off the case if hit due to its screwed bezel construction. This watch is fitted with a Sinn brown calf leather vintage style strap with white stitching. Verified Owner Comments: Okay first off I had a very positive buying experience with watch buys. They even called me the before they shipped the watch out. As for the watch, it is fantastic. I've had it on for 3 days and no joke it's gained about 2 seconds. The blue dial is stunning and I'm glad I got it over the black as I'm a blue watch kind of dude. If you like blue watches you won't be disappointed and the service from watchbuys is fantastic. Verified Owner Comments: Excellent craftsmanship! Sinn really knocked it out of the park with this rendition. As always, Watchbuys provides outstanding customer service. I will purchase my next automatic from them! "Sinn 104, blue face, black bezel on strap"
Verified Owner Comments: I own Rolex, Omega, Tag, Hanhart, Seiko......this Watch is an eaxample of classic, clean German ingenuity and quality. When people review my collection this always ranks at the top. Great weight, stunning to look at, yields compliments every time it’s worn. I absolutely love it, gets more wrist time than any of the other of the 14 quality timepieces I own. This color combo is striking with the brown strap. Love this Brand, adore this watch! Verified Owner Comments: Very good looking watch, I have a 7.3 inch wrist .Still wears well.Working with WatchBuys’ was Great! Verified Owner Comments: This watch is awesome. And the buying process couldn't have been easier. Shipping was super fast, and the watch looks amazing.